Best TVs to buy in 2015 | What Hi-Fi? If you're in the market for a new TV, you're in luck. We've rounded up a collection of the best TVs you can buy in 2015, from budget to premium, 3D to 4K and OLED. We round-up the best TVs to buy in 2015, from all of our expert reviews. 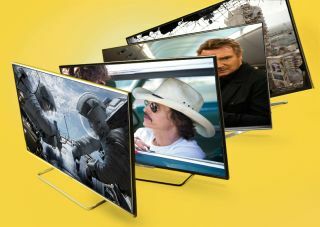 The TV market can be a dizzying maze of model numbers at the best of times, so we've compiled this list of the best by price and features to help chalk hours off your search time. All these televisions boast excellent picture quality through their built-in TV tuners, but we've also highlighted the best performers by TV technology (plasma, LCD/LED and OLED) and in terms of value for money, as well as picking out the best TVs for 3D and 4K content. One good omen for this telly is that its big brother, the 40in KDL-40W605B, emerged from our testing rooms clutching five stars and a Best Buy (see below). This 32in follows in its footsteps. With a good set of smarts, a rich, refined picture and a price within reason, the KDL-32W706B from Sony’s mid-tier W7 Series is another shining small-screen example from the Japanese giant. The Sony certainly delivers. And that’s true of its standard-definition performance as much as it is with HD. Whether it’s broadcast channels or a DVD, the picture bares impressive definition and neutral balance. With an attentive, punchy picture, decently detailed sound and a smattering of features, the KDL-32W706B is the full works with all the trimmings of a well-designed telly – eye-catching design, seamless interface and plenty of accessories. Buying a cheaper, smaller TV no longer means losing out when it comes to features, as this wallet-friendly 40in Sony LCD (£450) has all the smart capabilities of a higher-end model, and offers a decent picture and user-friendly interface to boot. We've seen a handful of good, four-star Sony TVs this year, but the KDL-40W605B is the best yet and earns that elusive fifth star with ease. Picture quality with both standard- and high-definition content is excellent, it comes with all the smart functionality you will need and is nicely designed and built. At the price, you can't go wrong. Samsung's UE48H6400 is currently our favourite 48 incher and also comes in at well under £1000. It's a great set to look at and live with. Key highlights incude a full suite of catch-up TV services, (including the normally absent ITV Player), internet radio and four HDMI inputs to cater for HD sources. The winning feature, though, is its beautifully balanced, clean-cut picture, which explodes with detail and rich, punchy colour. It's remarkable with both high and standard definition and even 3D is an enjoyable, engaging watch. The Samsung stands head and shoulder above the competition - it serves up a stunning image and it's easy on your pocket. What more could you ask for? What we’re really after is great picture performance across 4K, Full HD and standard definition. Is that too much to ask? Not according to this Samsung, which proves to be a rounded, versatile television – and not just in its restrained, elegant, near-rimless appearance. Even better, this Samsung is fully equipped with HDMI 2.0 ports and the HEVC decoder needed to stream Netflix in 4K. Time for a spot of Full HD, and we’re pleased to see the Samsung is just as capable here. The upscaled picture looks as good as it does on some of the best Full HD TVs. The sound is the weak point, but only in the usual flatscreen-TV way: it could do with more weight and greater dynamics, despite a decent sense of scale and good tonal balance. But we reckon with a TV this size chances are you’ll have a soundbar or full 5.1 system to boost the audio. We’re very impressed by the Samsung UE55HU7500. Its picture looks great across all resolutions and it has plenty of good features. If you’re looking to get a 4K TV right now, look no further. If you want to be at the cutting edge of Ultra High Definition (UHD), 4K technology, then this Samsung screen will guide you on your merry way. This 65in monster produces not just excellent UHD given the content, but awesome HD images upscaled to UHD too. Early adopters will soon be able to swap out the supplied One Connect box for the latest version which will include HDMI 2.0 connectivity, vital for handling UHD content at 50 and 60 frames per second. It should also be upgradable to support future standards for 4K broadcasts, downloads and any possible disc format as and when they're finalised. The Samsung produces a brilliantly clear and detailed image, even when it's faced with the task of upscaling standard Full HD. There's an impressive sense of subtlety and black depth and detail that's tough to beat. If you want to wow people with an immersive, almost out-of-screen 3D experience, then this Sony TV is the one we'd plump for. Four pairs of active-shutter glasses are thrown in with the set. Peer through them and you're treated to a wonderfully crisp and sharp image. The Sony does a great job of relaying depth and space to the viewer which makes for one of the most dramatic and effective 3D pictures we've seen in 2013, and will hold it in good stead for 2014. The '55W905A is stunningly designed too and comes with a comprehensive suite of smart features, with the Sony Entertainment Network a good resource of music and video content. There's no shortage of sockets either, with four HDMI inputs for all your high-def kit. Want to get behind 3D? This might just be the TV for you. Samsung's gone and thrown a bit of a curve-ball in the TV world by launching the KE55S9C. Not only is this 55in screen an OLED TV, as you can see from our picture, it's not flat, but curved! Such as the welcome lack of on-screen noise - the screen produces a ridiculously glossy and pristene image, bursting with colour. Throw in a couple of useful features such as MultiView, which allows two people to watch and listen to two different things at the same time, and you're looking at a radical slice of TV tech. We will be keeping this page updated as we do more TV reviews in 2014, so keep checking back to find out which sets we're picking out for recommendation.